Ukraine’s parliament has passed a bill granting the government the authority to suspend foreign debt payments. The bill’s stated aim is to protect state assets in case of an “attack” from dishonest lenders, and to help the ailing economy out of crisis. The bill passed by a 246-4 vote just hours after it had been submitted to parliament. The bill still needs to be signed by Ukraine’s President Petro Poroshenko to come into effect. "To protect the interests of Ukrainian people, the Government of Ukraine submits to the Verkhovna Rada today the draft laws, those enabling the Government to suspend payments on certain external public debts and guaranteed by the government debts, as specified in the Annex to the relevant Regulation of the Cabinet of Ministers. And in case of an attack from unscrupulous creditors to Ukraine, the moratorium will protect the assets of the state and of the public sector,"astatementon the Cabinet website said Tuesday. In its statement the current Ukrainian government blamed the cabinet of ousted President Viktor Yanukovich for increasing Ukraine’s debt by $40 billion. The people of Ukraine never saw the money, which was wasted, the document added. "It should be noted that granting such a right to the Government of Ukraine will affect neither the stability of the banking system of the country nor the exchange rate of the Ukrainian hryvnia. But by adopting this law we appeal to our foreign lenders with a request to support Ukraine and share the heavy burden with us,"the statement added. It also said the moratorium does not include debt to the IMF, the EBRD and other institutional creditors. 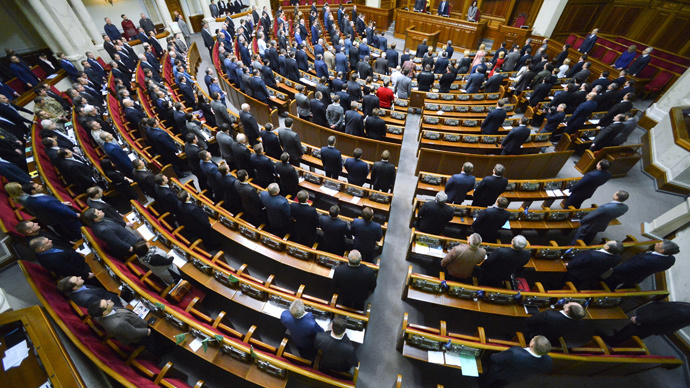 "We want to pay, but under conditions proposed by the Ukrainian government,"Prime Minister Arseny Yatsenyuk said during the parliamentary session. The Cabinet said the moratorium will not affect the bilateral and multilateral obligations of Kiev. The international community, including the United States, European Union and international financial institutions are helping Ukraine in this difficult time, said the statement. The country expects a $17.5 billion bailout from the IMF in the next four years, as well as $7.2 billion that will be loaned to Ukraine other countries and international financial institutions. Ukraine is on the verge of default. Ukrainian banks are the second most unlikely to repay loans after Nigeria, according to the International Monetary Fund's Global Financial Stability report. The total debt of Ukraine is currently estimated at about $50 billion, 71 percent of GDP in 2014. In 2015, the debt will reach 93 percent of GDP, according to the National Bank of Ukraine. Russia, one of Ukraine’s largest creditors does not intend to make concessions on its loan repayments. Russia expects Kiev to repay $3 billion be the end of 2015 for maturing 2013 Eurobonds. The country is seeing growing unemployment as the national currency is almost a third the value it was last year. The average monthly wage in the country is now one of the lowest in Europe at about 3,455 hryvnia, or about $160, said the Ukrainian Finance Ministry in January. The GDP is falling at an annual rate of 7.5 percent, and inflation is expected to hit 34.5 percent this year in 2015, according to central bank estimates. A recent opinion poll suggested about 70 percent of the Ukraine people are dissatisfied with their lives, and that events in the country are developing "in the wrong direction." The country is facing a task of survival, said Ukrainian Prime Minister Yatsenyuk earlier this year.